I had the good fortune to be invited to visit Thomas Jefferson’s home, Monticello, to speak at the Heritage Harvest Festival on September 11 & 12. There were lectures going on both days, but Saturday was the biggest day with booths on the mountaintop. 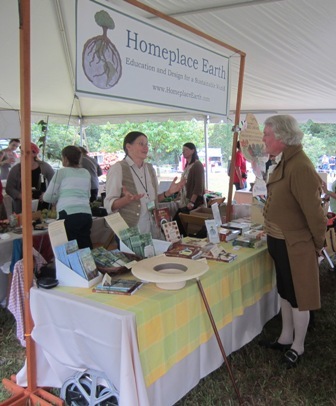 I had a booth for Homeplace Earth and Thomas Jefferson himself stopped by! Seeds were an important part of Monticello when it was a working plantation but, as you know, there is always something new to learn, so he had bought a copy of Seed Libraries at the visitors center to catch up. Mr. Jefferson was delighted to actually meet me in his backyard. Since he had planned to give a copy of my book as a gift, he bought another copy for me to sign to him. When he suggested I sign it to Mr. Jefferson, I said I might have signed it to T.J., which is how those of us in the region affectionately refer to him. He said go with T.J. We had a nice chat and I thanked him for having us all over to his place. That same day a woman came by and said she had been gardening for 30 years and wanted to know what I had to say that she didn’t already know. I told her about my work and my book Grow a Sustainable Diet. She bought a copy, along with my cover crop DVD. A gentleman who attended my Grow a Sustainable Diet talk has been an avid organic gardener since he was 23. He is now 70 and he told me that, even after 47 years of experience, he learned a lot from my talk. Yep, there is always more to learn. I met a woman from Indiana who had been coming to the Heritage Harvest Festival for four years (not consecutively) with two friends. They were there for both days and had talked the whole trip about what they were going to learn. One of the highlights for her was my Seed Libraries talk. She belongs to an organic gardening group which will most likely partner with their local library to start a seed library. I also talked with someone who had come from Tennessee. This is a popular event for people in the region, but each year I meet people who come from afar just to attend. It is their destination for a learning vacation. September is a busy month around here. Corn, cowpeas, and other dried beans are being harvested (sweet potatoes will be dug in October) and cover crops will go in soon. However, first I’ll be heading up to Seven Springs in Pennsylvania to the Mother Earth News Fair, which will take place this coming weekend, Friday through Sunday. My talks there are Grow a Sustainable Diet, Seed Libraries, and Managing Cover Crops With Hand Tools. I love sharing what I do with others at these events and through my DVDs and books. It is great having the opportunity to interact with so many people face-to-face to exchange ideas. I always learn something new through these encounters myself. See you at Seven Springs, or the Mother Earth News Fair in Kansas in Octob er! There are two exciting events coming up in September that I want to tell you about. I’ll be at both of them as a speaker and in the Homeplace Earth booth. 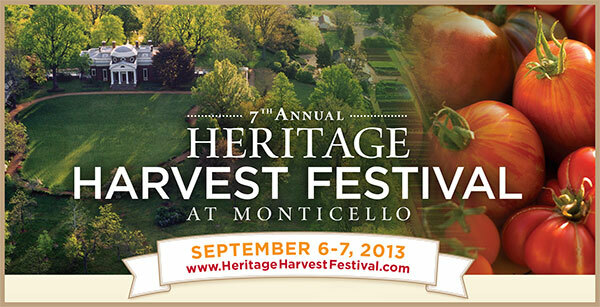 The 7th annual Heritage Harvest Festival will be held at Monticello, near Charlottesville, Virginia on September 6 and 7, 2013. The Mother Earth News Fair will be at Seven Springs Resort in Pennsylvania September 20-22. The Heritage Harvest Festival is hosted by the Thomas Jefferson Foundation in partnership with Southern Exposure Seed Exchange. On Friday September 6 all the activities take place at the LEED-certified Visitors Center. On Saturday September 7 the action is at the Visitors Center and up on the mountain on the grounds surrounding Monticello, Thomas Jefferson’s home. Jefferson was a champion for small farmers and for innovative ways. What an appropriate place for such a celebration! At the Heritage Harvest Festival you will have an opportunity to learn about many things, listen to some great music, and mingle with like-minded folks. There will be workshops and presentations on growing food, fermentation, seed saving, homestead animals, and other topics of interest for people seeking a more sustainable lifestyle. Some of the authors who will be speaking include Pam Dawling, Patricia Foreman, Ira Wallace, Harvey Ussery, and Barbara Pleasant. The title of my presentation both days is Grow a Sustainable Diet. There is a seed swap that you can participate in even if you don’t bring seeds to swap. One of the varieties of cowpeas that I grow originally came from there one year. There will be booths from vendors and organizations. Look for the Homeplace Earth booth in the large Master Gardeners tent. This is the fourth year for the Mother Earth News Fair in Pennsylvania. In 2013 Mother Earth News has also held a fair in Puyallup, Washington in June and will hold one in Lawrence, Kansas in October. You will find workshops and presentations on animal husbandry, green building, modern homesteading, natural health, nature and community, organic gardening, real food, and renewable energy. My presentations will be on Grow a Sustainable Diet and Solar Food Drying. Some of the presenters are authors of books from New Society Publishers, Storey Publishing, Timber Press, and Chelsea Green. There are many more presenters who, although not authors, have interesting ideas to share. You will find vendors here, of course, giving you an opportunity to see products you may only have read about and to talk with people who know about them. The Homeplace Earth booth is #2209. When I’m not speaking, that’s where I’ll be. There will be thousands of people at both of these events. If you are planning to attend either one, and need lodging, it would be wise to make your reservations now. It is exciting for people like me, who are presenting, to meet so many people eager to hear what we have to say. Likewise, it is exciting for the people who attend to have the opportunity to meet so many people all in one place who they may have only read about. Yes, you can read the books and blogs and watch YouTube videos for hours, but actually seeing someone in person talking about what they do is inspiring. You can really connect with their passion when you attend their presentation or talk with them in their booth. Most people I know are watching their pocketbook and trying not to spend more money than they have to these days, and there is a cost to these events. Considering how much you could learn in a weekend, however, these events are a bargain. If you feel the need to economize, pack a lunch. Check out the schedules ahead and plan your time carefully. You can pre-order tickets to the Mother Earth News Fair to save a few dollars. Over the years I have learned so much from others by reading their books and magazine articles. I have valued the opportunities to meet them in person and hear them speak, adding another dimension to my learning. The diversity of ideas and people floating around at these events are something you don’t want to miss. See you there!